The first meter was used on 23 August 1922. Franks are printed in red, with TMs on a few early stamps printed in black. See also “GUERNESY”, JERSEY” and “ISLE OF MAN” which are dependencies of Great Britain. The stamps are grouped according to the monogram of the reigning monarch and also according to appearance and use. Until approximately the 1940s, if a mailer used more then one postage meter, the license numbers were given a letter prefix, “A” for the second machine, “B” for the third and so forth. These license number varieties are not listed, but examples are worth a small premium over the basic catalog value of the stamp. Prefix letter “X” indicates the meter is a relief or loaner machine, temporarily issued to a mailer while his meter is being repaired. “X” varieties are listed. For specialized information about the meter stamps of Great Britain, see “GB Meter Franking ⎯ History with a Future” by Jack Peach, serialized in Gibbons Stamp Monthly, May-Dec 2001. * The corner squares contain the denomination which is also spelled out in the upper half of the circle. A bar through center contains "GREAT BRITAIN" and the license number. Four variations of center bar exist, as pictured. A1. Pitney Bowes (FV-1), 1922. Frank with wavy lines at sides. Center bar A, square ends and circular center. Frank size excluding wavy lines is 25 x 25mm. License number with or without “A” prefix. License number varies in size from small san-serif to large with serifs. A2. Universal Postal Frankers “N.Z.” (FV-6), 1922. Frank without wavy lines at the sides. Center bar B (round ends and open at top and with semicircle at bottom). Top portion of frank does not touch center bar. Frank 25 x 25mm. License number 1 only, except for A2D. The "NZ" model is a modification of the Moss Model "D" meter of New Zealand. The Model D was able to print the frank only, no town mark. The Type A2 version was basically a test bed for different ways of adding a town mark by use of a separate but attached printer for the town mark/slogan. It required the mail to be fed through the machine twice to bet both the frank and town mark/slogan. A2B. Black TM: three text lines and slogan within six wavy lines. With slogan “Don’t use Stamps, GET A FRANKER”. Very similar to Type A2 but the frank is narrower, 22mm wide. This is the first machine that allowed the frank and town mark to print together in a single pass. TM: SC in six wavy lines, with slogan (as Type A2C), in red. A4. Universal “N.Z.” (FV-6), 1923. Center bar C, bottom line straight across. Frank size 22 x 25mm. A4A. Red or black TM: text in two or three lines amidst six wavy lines. A4C. TM: small single circle, in black. License number 1 only (LEICESTER). A4D. TM with Wembley Exhibition lion within seven horizontal lines. License numbers 1, 12, X3, and X12 only. License number 1 is the only one known used on actual mail. The others are all found (so far) only as specimens. 1) The Exhibition was open from 23 April to 1 November 1924 and again from 9 May to 31 October 1925. The dates given for A and B span the known examples. It is possible earlier dates will be found for A. It also seems likely the machine was not in use during the second, 1925, session. 2) All the known examples of X3 and X12 are demonstration specimens dating from the period between the two sessions when the Exhibition was closed. 3) See also Type A7.1. A4E. TM: DC, BIC or SC, in red. A5. Universal “HS" and "EH” (FV-1), 1923. Frank similar to Type A4 but slightly wider, 23½ mm. TM: Red SC within seven wavy lines. Date in two lines. 1) The ½ value from meter 4 has a center bar with bottom line nearly continuous but with a nick out immediately below the license number. Remnants of an underline above the bar are also visible. 2) Catalog values are for examples on cut-outs. Full cover examples are worth more. As Type A5B but the top portion of the frank is joined to the center bar with double arcs at the sides. Frank style same as Types A4 and A5. TM: DC in six wavy lines, 45mm across. a. With slogan “Stamp Your LETTERS/ THIS WAY”. License number 15, found only on proofs. Wembley Exhibition town mark as with A4D but from different meter model. Small date figures rather than large as with Type A4D. NOTE: It is possible this machine was not used to frank actual mail. Only two examples are presently known to exist, both from demonstrations. A8. Universal “Midget” (FV-3), 1926. Normally with top of frank joined to center bar with single arcs at sides. Exceptions are a and b below. License number with “M” prefix. Upper image shows normal A8 plus A8a. Lower image shows A8b plus normal A8. A9. Neopost (FV-1, 4), 1925. Center bar D, open at both top and bottom. Top of frank joins center bar with double arcs. License number with “N” below except on variety a. “POST” and “PAID” in ribbons at lower corners above the prefix and license number. Center of frank surrounded by oval of petal-like shapes. B1. Universal “NZ” (FV-6), 1927. “NZ” at bottom left, License number at bottom right. B2. Universal “Special Midget” (FV-3). “M” prefix at bottom left. Frank 22 x 25mm. License number 5 only. B4. Universal “Midget” (FV-2, 3, 5). As B2 but TM DC or BIC. With “M” at bottom left, serif or sanserif. With “N” at bottom left. Bottom frame line continuous. B6. Neopost "2-V, 3-V, 2-VS, 3-VS, 6-VS" (1927 for the 2- and 3-values, 1930 for the 6-VS). As Type B5 but 43mm between the centers of the town mark and the frank. Double or single straight frame line/s inside faux perforation outer border. NOTE: Several of the values are scarce and worth a premium to some collectors. B7. Pitney Bowes “Models A, B and F” (FV-1). Crown and GvR in center. License number “PB” can be at either left or right. Spacing between TM and frank wide (17mm) or narrow (3mm). B8. Pitney Bowes “Model H” (FV-5). With “H” at bottom left. Spacing between TM and frank very wide, 27mm. Value figures variable in height. B9. Universal “Multi-Value” (MV), 1932. Value in center, crown and monogram at bottom. With “U” at bottom left. B10. Pitney Bowes “Model CV” (LV-6). Normally with “P” at bottom left. C1. Universal “Midget” (FV-2, 3, 5), 1936. With “M” at bottom left. C3. Neopost (LV-2, 3, 6). As Type C2 but 43mm between the centers of the town mark and the frank. With “PB” at bottom left. C6. Pitney Bowes “Model CV” (LV-6). With “P” at bottom left. D1. Universal “Midget” (FV-2, 3, 5), 1937. As Type D2 but 43mm between the centers of the town mark and the frank. Frank 23mm or 25mm wide. D4. Pitney Bowes “Model H” (FV-5). Frank 21 x 24mm or 23 x 25mm. Wide spacing between TM and frank. D5. Pitney Bowes “Models A, B, F” (FV-1). Frank with nine or ten petals at each side. Double or single line bottom frame line. With “U, UA, UB… UF” at bottom left. D7. Pitney Bowes “CV” (LV-6). “POST PAID” in small panels above License number and prefix. Small frank, 22 x 25 mm. D8. Pitney Bowes “CV” (LV-6). As with Type D7, “P” at bottom left. “POST PAID” in arc above postage value. Frank larger than Type D7, 26-27 x 28-30 mm. With “NZ” at bottom left. Similar to other Group D types except the central area is circular rather than oval. “POST” and “PAID” near top above value. With “S, SA, SB…” at bottom left. With “NA” at bottom left. License number 156 only known. E1. Universal “Midget” (FV-2, 3, 5), 1953. Bottom frame line broken in two spots near the center. With “N” at bottom left. E3. Pitney Bowes models “A”, “B”, “F” (FV-1). With “U, UA, UB…” at bottom left. E6. Pitney Bowes “CV” (LV-6). With “P” or “PA” at bottom left. E8. Neopost “Frankmaster 305” (MV). With "NA, NB, NC..." at bottom left. Distance between town mark and frank is variable. With “A, AB, AC…” at bottom left. "GREAT BRITAIN" in ribbon at bottom above License number. F1. Neopost (LV-6, 8), 1959. License number with “N” prefix. F2. Pitney Bowes “CV” (LV-6). License number with “P, PA, PC” prefix. F3. Pitney Bowes “Simplex” (LV-21?). License number with “S, SA, SB…” prefix. NOTE: Value figures known both in serifed, variable thickness font (at left) and in plain font (at right). F4. Universal/Pitney Bowes “Multi-Value” (MV). License number with “U, UA, UB…” prefix. F5. Pitney Bowes “Automax” (MV). License number with “AA, AB, AC…” prefix. Value figures always and only in plain font. F6. Roneo Neopost “Frankmaster 305” (MV). License number with “NA, NB, NC…” prefix. F7. Roneo Neopost “205” (MV). License number with “J” prefix. F8. Roneo Neopost “105” (LV-10). F9. Pitney Bowes “5000” series (MV), 1963. License number with “P.B.” prefix. F10. Pitney Bowes “RT” (MV). Smaller frank than Type F8. License number with “RT” prefix. F11. Roneo Neopost “605” (Postalia “P3” ) (MV), 1966. License number with “TN” prefix. G1. Hasler “F88” (MV), 1967. License number with “fml” prefix below column of horizontal lines or below “POSTAGE PAID”. B. Meter number below "POSTAGE PAID"
The frank dimensions shown in the descriptions are from the outside of "GREAT BRITAIN" to outside of "POSTAGE PAID" and from the top to bottom frame lines. The License number may extend below the bottom frame line in some cases. Most stamps of this group (and some in earlier groups) have meter/license number suffixes as well as prefixes. The suffixes are a means of extending the range of numbers available. They can also symbolize information such as the year the meter was deployed. HA1. Neopost “105” (LV-6, 8, -10), 1968. License number with “N” or “NA”, “NB”, “NC” etc. prefix. NOTE: Through acquisition Neopost postage meters became products of Roneo, Roneo Vickers, Roneo Alcatel and Neopost Alcatel. For the sake of simplicity this catalog uses ‘Neopost’ for all of them. HA2. Neopost “205” and "2205" (MV). License number with “J”, “JA”, “JB”… , "P", or "2N" prefix. HA3. Neopost “Frankmaster 305” (MV). License number with “N–“, “NA–“, “NB–“, “NC–“… also “PX–“ prefix. License number with “R”, “RD”, “RH”, “RM”, “RN”, “RR” or “RV” prefix. NOTE: This stamp with “RN” prefix is a specimen. HA6. Pitney Bowes “CV” (LV-6). License number with “PB C” prefix followed by 3-digit number and “A”. HA7. Pitney Bowes “Simplex” (LV-25). License number with “P.B.S” prefix. Frank variable in size from about 23 to 26 mm wide. HA8. Pitney Bowes “Automax” (MV). License number with “P.B.A” prefix. HA9. Pitney Bowes “RF” or “RT” (MV). License number with “P.B.R” prefix. A. Large DC TM, ~21 mm with 4 mm spacing between rings. B. Small DC TM, 19 mm with 2½ mm between rings. HA10. Pitney Bowes “5000” series (MV). Value figures are below level of date figures. License number with “fml” or “FML” prefix. NOTE: Type HA12 in the previous version of this catalog is now cataloged as Type HA10A. HA13. Pitney Bowes “6300” series (MV), 1970. License number with “P.B.” prefix plus 4-digit number and letter, or with “P.B. D” or “P.B. L” prefix and a 3-digit number and letter. Date and value figures are on same level. NOTE: See Type HA24 for a similar stamp. License number with “G” prefix. HA15. Friden “9222” (MV), 1970. HA16. Hasler “F66” (MV), 1973. License number with “HAS” and "HGB" prefixes. TM: DC, without stop after year. NOTE: Type HA16 closely resembles Type HA11 which has a stop centered after the year figures in the date. Type HA16 has no such stop. HA17. Neopost “105-2” (LV), 1973. License number with “W” prefix. NOTE: Type HA18 in the previous version of this catalog is now cataloged as Type HA2B. HA19. Hasler “Mailmaster” (MV), 1978. License number with “HB, HF, HM, HT” prefix. NOTE: Type HA20 in the previous version of this catalog is now cataloged as Type HA10B. HA21. Pitney Bowes “6900” series (MV), 1986. License number with “PBF or PBG” prefix. HA22. Pitney Bowes “A900” and “B900” series (MV), 1991. License number with “PBC”, “PBW”, or “PB9” prefix followed by 4 or 5-digit number. HA23. Pitney Bowes “Paragon” (MV), 1992. License number with “PBP” or “PBQ” prefix. HA24. Pitney Bowes “6600” (MV), 1993. Similar to Type HA13 but frank is taller than wide. License number with “PBB” prefix. HA25. Frama “E3/E4” (MV), 1982. License number with “MMC”, later “FSC” prefix. Value figures tall and thick. NOTE: See Types HA33, HB8, HB9 and HB10 for other stamps with “FSC” prefix. HA26. Neopost “Electronic” series (MV), 1983. License number with “1NE, 2NE, 5NE, 6NE, 7NE, 8NE” prefix. License number with “3NE” prefix above broken bottom line. HA28. Neopost “9000” (MV), 1988. License number with “9NE” prefix above broken bottom line. NOTE: See Types HA36 and HB2a for stamp with same prefix. HA29. Francotyp “A9000” (MV), 1969. License number with “EGS” or “AC.A” prefix breaks bottom frame line. License number and prefix variable in size from small to quite large. Value figures large and thick. HA30. Postalia “P3” (MV), 1983. License number with “ENV” prefix. HA31. Postalia “MS5” (MV), 1984. License number with “EMD” prefix. The bottom frame line is complete. HA32. Francotyp-Postalia “EFS3000” (MV), 1986. License number with “EFS” prefix. HA33. Frama “EPS” (MV), 1994. License number with “FSC” prefix. NOTE: See Types HA25, HB8, HB9 and HB10 for other stamps with “FSC” prefix. HA34. ASCOM Hasler “Smile” (MV), 1995. License number with “HS” prefix. HA35. SECAP “Alpha” and “Minipost” (MV), 1996. License number with “ASA” or “ASM” prefix. HA36. Neopost “SM75/SM85” (MV), 1998. License number with 9NE 5” prefix. Bottom frame line is complete. HB1. Ascom Hasler "InteliPost" (digital). License number with "A" prefix breaks bottom frame line. HB2.1. Frama “Sensonic 2000” (digital/thermal), 1999. License number with “FSC2” or "FSC3" prefix above bottom frame line. Printed in red or blue. NOTE: See Types HA25, HA33, HB2.2 and HB2.3 for other stamps with “FSC” prefix. License number with “FSC7” prefix breaks bottom frame line. NOTE: See Types HA25, HA33, HB2.1, and HB2.3 for other stamps with “FSC” prefix. Very similar to Type HB2.1 but the frank and town mark are slightly larger. License number with “FSC9” prefix above bottom frame line. NOTE: See Types HA25, HB2.1, and HB2.2 for other stamps with “FSC” prefix. HB2.4. Frama “Matrix F2/F4/F6” (digital). Very similar to Type HB2.3 but the value figures are wider. License number with “F1” prefix above bottom frame line. HB3.1. Francotyp-Postalia “T1000/T1000S” (digital/thermal), 1992. License number with “T” prefix above bottom frame. Single column of vertical numbers reading up at left of TM. License number with “FJ” prefix above bottom frame line. HB3.3. Francotyp-Postalia "Centormail", “MyMail”, "Ultimail" and “Optimail” (digital). Similar to Type HB3.2 but the frank is taller and the date figures are slightly more widely spaced. The vertical numbers at left of the TM are shorter than with Type HB3.2. Found in blue as well as red. HB4.1. Neopost “SM22/26” (digital), xxxx. Very narrow spacing between TM and frank. License number with “4NE” prefix. HB4.2. Neopost “IS-330/350" and "IJ25” series (digital), 2000. Printed in red by ink-jet method. b. Error: Used commercially with town mark "NEOPOST SPECIMEN"
HB4.3. Neopost “IJ65/75/80/90/110” (digital), 2000. Similar to Type HAxxx but value figures slightly wider. Date as “00–00–00” or "00.00.00". a. License number in N124 or N129 series can be from any of the HB4.3 models. HB4.4. Neopost “IJ65/75/80/90/110” (digital), 2000. License number breaks bottom frame line. Very small date figures slightly above the level of the value figures. License number with “N50” prefix breaks bottom frame line. HB5.1. Pitney Bowes “PostPerfect” (digital), 1995. Small frank with two columns of stacked numbers left of TM. License number with “PB7” prefix. HB5.2. Pitney Bowes “PersonalPost” (digital), 1998. Short frank printed by ink jet method which leaves telltale horizontal tracks within the frank. Two columns of stacked numbers left of TM. License number with “PB2” or "PB4" prefix breaks bottom frame line. HB5.3. Pitney Bowes “DM200/250” , “DM225/300” , “DM100i/150i/110i” , "DM400C/450C/475C" , and "DM50/55" (digital), 2000. Stamps from these models are identical in appearance except for License number prefix. License number prefix breaks bottom frame line. Known printed in blue as well as red. A. DM200/250 (and possibly DM300C): “PB30/31/37"
D. DM50/55: "PB0" prefix, later "PB33/34/35..."
Meter model names and prefixes change somewhat frequently. The correspondences shown in A through E above are an educated shot in the dark. HB5.4. Pitney Bowes “DM-400/-500”, later "Connect+ 1000" (digital). Very similar to Type HB5.3 but with only one column of stacked numbers left of the TM. License number with “PB50”, “PB52” or "PB550/551" prefix breaks bottom frame line. HB5.5. Pitney Bowes “Connect+ FC” , later "Connect+ 2000" (digital). Identical to type HB5.3 except the machine is capable of printing slogans and other data in multiple colors completely across the top of an envelope. Two columns of alpha-numeric characters left of the town mark. License number with "PB555/556/557" prefix breaks bottom frame line. HB5.6. Pitney Bowes “DM160i/220i” (digital). Very similar to Type HB5.3 but the value figures are more widely spaced with zeros that are more squarish than oval. Meter prefixes PB16 and PB8 seen. HB6. Secap / Pitney Bowes “DP-200/-400” (digital). Small frank and short date figures. With block of alpha-numeric characters in three lines at lower left of TM (found also on Type HB1). “Royal Mail” at top, license number at bottom. 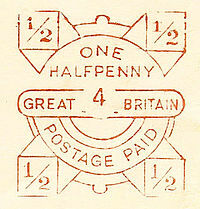 Without crown, "GREAT BRITAIN" and "POSTAGE PAID". The country name, changed to “United Kingdom”, is in the town mark. License number with “PBC” prefix. License number with “PBG” prefix. License number with “AH3” prefix. License number with “AH1” prefix. License number with “NE5” prefix. License number with “NE6” prefix. License number with “NE8” prefix. License number with “FPM” prefix. License number with “FPE” prefix. License number with “FAE” prefix. Mailmark is a trademark of Royal Mail. The stamps do not contain a town mark. The stamps are nearly identical and can be identified most easily by the license number prefix. Because of their identical nature, not all the stamps are illustrated. The variations found in the "A / Europe" stamp probably are found in any stamp with overseas destination. Mailmark stamps are replacements for Group HB. J1.1. Pitney Bowes "DM160i/220i" (digital), 2014. A. License number with "PB16/17" prefix. Found in red as well as blue. B. License number with "PB20" prefix. Seven digits in license number. J1.2. Pitney Bowes "Connect+" (digital), 2014. License number with "PB55" or "PB66" prefix. NOTE: The Connect+ model is capable of printing a multi-color slogan across the entire length of the envelope. J2.1. Frama "Matrix F12..." (digital), 2014. License number with "FR2" prefix. J3.1. Neopost "IS-240/280" (digital), 2014. License number with "NE6" prefix. J3.2. Neopost "IS-480" (digital), 2014. License number with "NE8" prefix. J3.3. Neopost "IS-5000/6000" (digital), 2014. License number with "NE9" prefix. J4.1. Francotyp-Postalia "PostBase Qi3/4/6/9" (digital), 2014. License number with "FP611" prefix. PC1. Royal Mail “SmartStamp” (digital), 15 January 2004. Square 2D barcode at left with value figures and identification code above and the ‘POST BY’ date below. At center is a large negative letter indicating the class of mail/ “ROYAL MAIL”/ and a postage paid statement. At right are two vertical bars of uneven widths (a mail class barcode). a. For use in Wales, with "POST/ BRENHINOL" replacing "ROYAL MAIL"
b. "POST BY THE END OF" instead of "POST BY"
d. “ROYAL MAIL”/ the postage paid statement/ “SmartStamp.co.uk”. e. “ROYAL MAIL”/ service/ and the postage paid statement. f. With "Signed For" postal direction added below the frank. Examples: "Signed For 1st Class", "Int Signed For Small Packets"
NOTE: The SmartStamp on-line postage program was overhauled in August 2006. The update allowed users to add slogans in color. Some minor changes appeared in the frank but they are not consistent. For example, “POST BY” is often larger but is also found in the earlier, small size. The value figures and inscriptions can also vary in size. The frank may be slightly smaller than the first version although this may be due to printer variables rather than software changes. As Type PC1 but the mail class indicator is positive and "ROYAL MAIL" is negative at the bottom. Due to the early date (March 2004) this may be an early experimental or test design. NOTE: "PF" is probably not the only code that is rarely found. PO1. Horizon (digital), 14 February 2002. Plain white self-adhesive label with rounded corners and anti-peel slits. Large service indicator code at top between horizontal bars. Below the code are “Royal Mail”/ ”POSTAGE PAID UK”/ date, value figures, post office ID/ numeric coded data in the form of #-########-#. b. For use in Wales, with “Post Brenhinol/TALWYD Y POST DG” (or “Talwyd Y Post DG”) added below “POSTAGE PAID”. c. As b but misspelled as "Post Brenhino"
NOTE: First day covers are rare because the first day of use was not announced publicly. As Type PO1 but the label shows a large version of the Arnold Machin portrait of Queen Elizabeth in gold and white. D. As B, with "." plus lower case letter after "Royal Mail" and a number added after "POSTAGE PAID UK"
Two formats for the date are known: DD/MM/YY and DD-MM-YY. a. For use in Wales, with “Post Brenhinol/TALWYD Y POST DG” (or “Talwyd Y Post DG”) added below “POSTAGE PAID”. NOTE: The added letter and number of sub-type C indicate the service and tax rate applied to the postage. As Type PO2.1B but the label is for domestic use only. It does not include "Royal Mail" or "UK". * Unique postage number ("postage recognition number" ?) with "PRN:" prefix. 2D barcode at lower left, service indicator code ("L" - letter, "S" - special delivery) or mail class ("1", "2") at lower right. Label is predominantly white with Machin portrait of Queen Elisabeth II in pale color at upper right. The stamp is as Type PO2.1D and has the addition of "· SINGLE USE ONLY ·" between two semi-circles at lower right. Otherwise as Type PO2.1B for international use. A. The portrait and underprint are printed in beige. B. The portrait and underprint are printed in gray. Label as with Type PO3.1 but stamp as Type PO2.2. PO3.3. Horizon, Post&Go Kiosk (digital), 2016. At right of the 2D bar code field are various codes between two parallel lines. Simple square frank with crown at top. Double circle TM with POSTAGE DUE at bottom. Special slogan SURCHARGE POSTAGE DUE. Nearly square frank with TO PAY at top. With or without special slogan “(town name) SURCHARGE DUTY”. NOTE: Catalog values are for loose tapes. Produced by two experimental machines used at Romford and Cambridge to March 1948 when they were withdrawn. Boxed “PARCEL POST” vertical at left. PP2. Westinghouse-Garrard Ticket Machines Ltd. (MV), 1947. From an experimental machine used between Dec 1947 and Nov 1948 at Cambridge and between Feb 1949 and Aug 1950 at Birmingham. Printed in red on white labels. As Type PP1 but “PARCEL POST / PAID” in the box at left, and the crown above value figures is smaller. From two machines used from Sep 1950 at Romford, then from Jan 1952 at Aberdeen and Harrogate. The machine used at Harrogote was moved to Leith after Feb 1955. TM: DC at right of frank. Special design used at Festival of Britain exhibition in London between May and September 1951. Similar to Type PP3 but slightly wider and with center section closed at left. Festival of Britain logo in box at left. From two experimental machines used in Birmingham and Cambridge to about 1958. Design similar to Type PP3 but smaller and without straight inner line in value box. Large Crown at top of value box, and without monogram of monarch at bottom. With boxed “POSTAGE / PAID” vertical at left. From a trial machine used from Sep 1958 to late 1959. Values: 1d to 19/11 in 1d increments. Postage values below 1/ are preceded by “=”. PP8. Setright Registers Ltd. (MV), 1959. As Type PP7 but with boxed “PARCEL POST / PAID” at left. Used by the London and North Eastern Railway at Ipswich between 1933 and 1934. Purple impression on orange labels. Center line printed through a ribbon includes operator’s ID letter, amount paid, sequence number and date. Used by the London and North Eastern Railway at Kings Cross, Liverpool Street, and Newcastle. Purple impression on gray green label. Center line printed through a ribbon includes clerks ID number, amount paid, rate, and sequence number. From an experimental machine used in 1947 and 1948 at various stations including Harrow, Brighton, Luton, Kings Cross and Slough. Upright rectangle with outer frame line. Tall stamp used by the London and North Eastern Railway at Kings Cross. Purple impression on green labels. Plain stamp with station name in center and date-rate line at bottom. Used by the London and North Eastern Railway at Kings Cross and Liverpool. Purple impression on white with very pale green or pale blue underprinting (“British Railways” diagonally). Bottom line printed through a ribbon shows date, sequence number, and amount paid. From an experimental machine used between 1951 and 1952 at Brighton, Southern Region. Frank has straight-line frame lines segmented into several boxes. The top of the frank is open at the top above the station name. Shown vertically at left outside the frame at left are BRITISH RAILWAYS / S REGION / BRIGHTON. Purple impression on white paper straight at top and bottom, serrated at the sides. Similar to RP6, this stamp was used when no cash was involved at time of dispatch. Station name vertical at left. Purple impression on white label. NOTE: The "COND. NO." box at right usually contains a number. Less often are found a dash or "NON / ISSUE". As Types RP6 and RP7 but the outer frame line is unbroken across the top. Station name vertical at left, L.N.E.R. / IPSWICH. The top center segment contains only the parcel stamp number, without the station name. Red impression on tan label. NOTES: Type RP7.1 preceded Types RP6 and RP7 by nearly 15 years. L.N.E.R. stands for London and North Eastern Railway. Town line boxed in center with value line above and serial number and date below. Purple impression on cream paper. Separation by two long slits at top and bottom. Stamp used by British forces in East Africa during World War Two. This was a Ceylon stamp converted from normal use by removal of “CEYLON” from the upper panel. Not known used with attached town mark. NOTE: See also Type HA21a for a vending machine stamp. PV1. Wilkinson (Automatic Stamp Selling Machines) (FV-1), 1912. Circular stamp with “POSTAGE PAID” and crown below value figure. Used from 25 January to 31 August at G.P.O. London E.C. NOTE: The Wilkinson machine was promoted in the philatelic press of the day, and several stamp collectors made a point of getting examples on the first day of use. Use of the machine tailed off rapidly thereafter. It was finally removed from service because of lack of use. The stamp is similar to Post Office stamp Type PO1 but the printed design is nearly square rather than tall like PO1. The bottom line is in a much smaller font than with PO1. * Three machines were trialed in Alfreton, Broadgate (London), and Luton. * They were withdrawn from service after eight months of use, on 20 October, due to slow and awkward operation. PV2. Pitney Bowes and Fujitsu “Post & Go” (digital), 29 January 2007. The stamp is nearly identical to Post Office stamp Type PO1 and is most easily identified by the lengthier alpha-numeric code at lower right which has the form of ##X####X-######-##. (or PAG-######-#)??? NOTE: Two kiosks were tested in Birmingham starting on the date indicated. Soon after other kiosks were installed in Birmingham and Belfast and at other locations even later. PV3. Wincor Nixdorf "Post & Go" (digital), 8 October 2008. Horizontal label with service indicator at top center above "Royal Mail"
NOTE: These machines also produced dateless stamps that could be used anytime and anywhere. Such stamps show the Machin profile portrait of the Queen or color illustrations. They are not cataloged here. PV4. Wincor Nixdorf "Post & Go” (digital), 7 May 2010. Similar in design to Type PC1 but without the square digital bar code at left. Both "1st" and "2nd" stamps are found and have different bar configurations at the right. With or without service indicator added below the value figures. The stamps are printed on self-adhesive labels with security field at far left. B. Standard design printed on label with simulated perforations at top and bottom. The security field varies in density, is wider and touches the edge of the label. This page was last edited on 11 February 2019, at 15:23.